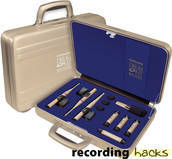 The DK50/R is Earthworks’ premium 3-mic set for drum recording. It consists of a matched pair of the company’s top-of-the-line QTC50 High-Definition™ omni condensers for overheads, plus a Cardioid SR30 condenser for kick drum. The included KickPad is an inline pad and EQ filter for the SR30; it cuts the high output level of the mic, reducing the likelihood of clipping at the preamp. It also applies some equalization, turning the SR30’s relatively flat response into a tailored kick-drum sound. Also included are three of the company’s LevelPad devices. The LevelPad is an inline attenuation pad, switchable between -15dB and -30dB.